Oh, hello everyone! 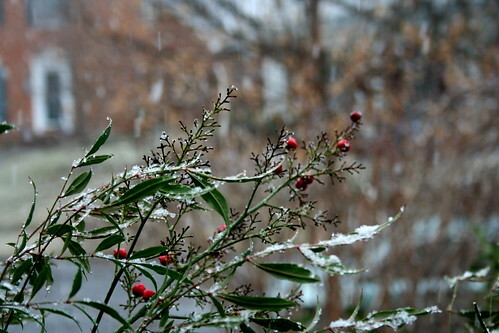 It seems that I’ve forgotten you in my muddle of teaching and going to school and cooking for two and avoiding snow (it’s snowing again–will it ever stop?). It seems that I’ve had a case of the February blahs–my cooking has been pretty bare, just like the trees outside (well, when they’re not covered in snow, but you get the idea). I’ve been subsisting on a steady stream of lentil quinoa falafels for lunch when I’m teaching (the batch makes a ridiculous number of servings–I think I’ve eaten it for 12 meals thus far, and, yes, I’m getting rather sick of it), soup I’ve stored in the freezer, and overnight oats. But now that it’s March and hopefully the weather will turn relatively soon (I’ve got my fingers crossed for a snow-free birthday), I hoping that my creativity will bound back. In the meantime, here’s a recipe I meant to give you weeks ago, right after Valentine’s Day, actually. Granted, the photographer and I have just started dating, but I wanted to give him something special (and homemade) for Valentine’s–and I knew it had to be chocolate (he’s a dark chocolate fiend, one of the many reasons we get along so well). I toyed with making Homesick Texan’s Mexican Chocolate Pralines, since he hails from Texas, but I never got around to finding any Mexican chocolate and with Fresh Market right up the road, I knew I could get some high quality dark chocolate and truffle oil easily. The pralines, though, trust me, are on the to-make list. Using Hannah’s recipe almost exactly, I was surprised at home easy and intensely chocolatey these truffles are. If you don’t have a microwave, of course, you can use a double boiler. As for the intensity–watch out–these truly are for the chocolate lovers at heart. The truffle oil adds this crazy, earthy element to the chocolate, and to some, I’m sure, it’d be too much. I was even a bit terrified to give these to the photographer, given how intense they are, but, thankfully, he loved them. You do want to cut the truffles into tiny squares–one square goes a long way–but other than that, I’d recommend the recipe for anyone wanting something insanely decadent and delicious. Line an 8 x 4-inch loaf pan with aluminum foil and lightly spritz with cooking spray. Set aside. Place the chocolate, coconut cream, and olive oil in a microwave safe bowl, and heat on high for one minute. Stir thoroughly with a spatula, and if necessary, heat for an additional 30 – 60 seconds, stirring thoroughly between each 30-second interval until completely smooth. Add in the truffle oil, mix well to incorporate. Pour the liquid chocolate into your prepared pan, and lightly dust the top with a pinch of sea salt. Let cool, and then chill in the refrigerator for at least 3 hours before proceeding. Once cool and firm, use the foil like a sling to pull the truffle rectangle out of the pan, and set it on a cutting board. 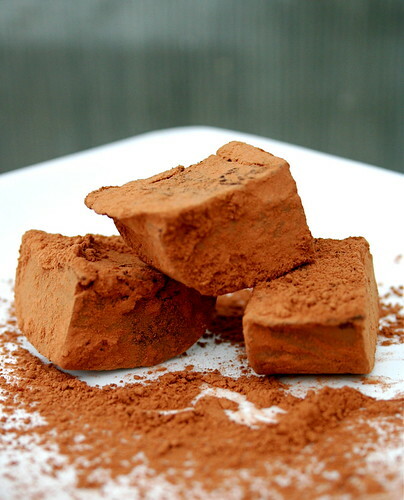 Slice it into very small squares, about 1/2 – 3/4 inch, and dip the sides and bottoms into the cocoa powder. Let come to room temperature before eating for the most powerful truffle flavor, but keep chilled in an air-tight container for storage. Wow those look so amazing. He is a lucky man. I have been struggling to blog too, it is totally the weather! In a few weeks we are going to have asparagus and all sorts of fun stuff so hang in there! Oh I’m so happy these were enjoyed! I too was worried that they would be too intense for most, so it’s a relief that they were largely a hit. Hooray for ultra-rich truffles and the people who love ‘em! Mmm, those look delicious! I can’t beleive I somehow missed the original posting, but these are definitely on my radar for the next time I need something decadent! GASP! You have a LIFE outside of BLOGGING? Glad you’re well, and thanks for checking in. These truffes are real double-truffe with the truffe oil! I wouldn’t have thought adding this oil in truffes. If you liked it, I should give it a try. Thanks. I am definitely with you on the February-blahs thing, as well as the I-am-so-sick-of-snow thing. But chocolate is a sure cure—and I’ve been “medicating” myself with it frequently. The photographer is a lucky man. I need to find some truffle oil. When Hannah posted those, I wanted to make them but never did. They sound like a perfect gift for my dad. Wholly crap! Those truffles look like they could kill me with goodness! Ill take two! These look like my dream come true! You can’t get to intensely chocolate for me!I like that they look slightly soft and chewy. Talk about decadent!